The storage capacity of computers and mobile devices is increasing, but for many of us, this is still not enough. Cloud services are the most convenient way to expand your options when it comes to data storage. You will be able to keep a large number of files and the best part is that they will be available, whenever you need them. There are many cloud storage solutions available and a lot of users have opted for using multiple services simultaneously. This offers a greater level of flexibility as you can use each service for a different purpose and store more data online. While using a variety of cloud service offers many advantages, managing your files across them can be a challenge. This is when a tool like odrive would become a practical solution. Created by Oxygen Cloud, a California-based company run by professionals with an extensive experience in cloud services, odrive is a meta cloud that unifies all your clouds, apps and storage for better access, sharing and security. With odrive, you can access all your cloud services in one place and manage your data across them without hassle. Here you will find out more about this solution to sync all your clouds. The first thing to note is that odrive doesn’t provide storage itself. As a cloud aggregator, it is focused on offering those who use a variety of cloud storage services, an effective and easy to use solution to manage the data stored in these services. odrive has a high quality software and useful features that will allow you to save time. Instead of having to access each cloud service separately, you can rely on Odrive’s efficient performance to manage them from a centralized location. It is a tool that can improve your productivity and it supports a large selection of cloud storage providers. When it comes to cloud aggregators, one of the main aspects to consider is the list of cloud storage services and apps that it supports. In this regard, odrive stands out since it works with an extensive selection of options including Google Drive, Dropbox, OneDrive, Amazon Cloud Drive, Box, Yandex Disk, Instagram, Facebook, Gmail and Picasa. With Odrive, you will be able to download media content from Facebook, photos from Instagram and attachments from Gmail easily. All the services and apps that are compatible with odrive, can be linked to your odrive account so that you can start managing content in the same place. They also support company storage solutions like Oracle Documents, OneDrive for businesses and Oxygen Cloud. You can also get files from Amazon S3, B2 Cloud storage, as well as FTP, SFTP and WebDAV servers. Linking a cloud storage provider or a social media app with odrive is simple and will give you better and easier control over your files. odrive is focused on cloud syncing, but it also has sharing capabilities. The desktop software is powerful and supports the main functions that you would expect from a cloud storage service. You will be able to drag and drop files, edit them, create new folders, transfer data between folders or move folders and more. All the changes are synced to each cloud provider. This essentially means that everything you do on odrive will be reflected on the relevant cloud provider. In terms of syncing, odrive offers a great set of features that will simplify data management across multiple clouds. The Universal Sync folder allows you to keep in one place, everything that has been added from the cloud services you use. It is the folder in which you will find the data that odrive has aggregated from different sources. odrive’s cloud sync doesn’t rely on a stand alone interface as it integrates with your file manager. You have the option to automatically unsync old files that you don’t access regularly. This also works for cloud services that you don’t want to use anymore. Another practical feature is Progressive sync, which allows you to download cloud files only if you really need them. You can see all the files that you have without taking up space on your hard drive. odrive uses zero-byte placeholders known as CLOUDFX files and they will only be downloaded when required. The default file size limit for auto-download is 500MB, but you can customize this according to your needs. With odrive, you can also sync folders from USB drives and network file servers. Once the external storage is connected, the folders will be automatically synced. All of these options work in an impressively fast manner due to the direct connection and optimized transfer functionality that the software supports. Although odrive’s sharing capabilities may seem basic when compared to those supported by some cloud storage providers, they will suit the needs of most users. 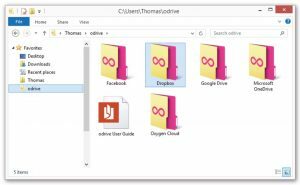 You can create a link to any file or folder synced to odrive and share it with others. It is possible to set expiration dates for this links or protect the content with a password. You can invite friends, family or colleagues to sync any odrive folder. However, there are no collaboration options available as other users can’t edit or upload again a shared file that has been updated by them. odrive offers an additional feature that allows you to create encryption folders and protect your data with zero-knowledge encryption. There are cloud services that hold the keys to decrypt your data, but zero-knowledge encryption ensures that your information remains private because only you have the keys to access it. With the encryption add-on, your data is protected with a secret passphrase that is only known by you. It uses strong, military grade AES-256 encryption, which keeps your data safe from eavesdroppers, hackers and other threats. There is a free solution that will allow you to use the majority of the features that odrive offers, including centralized management for all your linked cloud services, sharing and syncing. You can create a free account by signing in with the service of your choice. In order to get customization options and protect your data with high encryption, you need to upgrade to the premium plan, which costs $8.25 per month. When you sign up for odrive, you automatically get access to Premium features for a limited period of time. After that you can upgrade your account to continue using these features. odrive offers a 30-day money back guarantee. 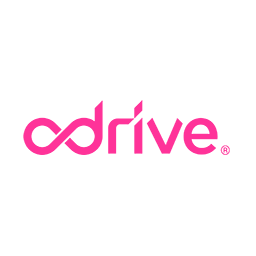 odrive is a service that is definitely worth trying as it can simplify data management and allow you to take full advantage of your cloud storage services. It integrates seamlessly with cloud services and social media apps, allowing you to keep all your data accessible and secure. They are planning to extend the list of services supported and to add backup and other convenient features in the near future. 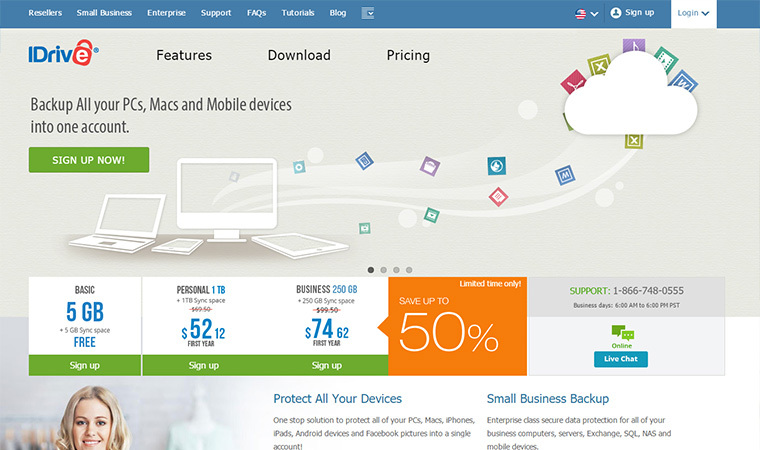 odrive is one of the most convenient cloud aggregators available and it offers a remarkable software.